So, I *was* going to blog yesterday (and the day before), but stuff got in the way. Not work (though that is leaving me in a semi-vegetative state), not school (though I did manage to write the correct paper with a whopping 5 minutes to spare), but just…Stuff. So what the heck have I been up to? Well, there’s some sockage, among other things. The chilly nights recently (and my home’s lack of carpeting) gave me some motivation to knit something for myself. I don’t know why, really, but I have a hard time knitting for me. A sickness? An Issue for a therapist? I don’t know. I just feel so guilty. This was the Tuesday after the horrible Fair Isle disaster, and I didn’t want anything hard. No pretty color changes, no fancy lace, or edging or anything. Just some quick slipper booties to keep my toesies warm. As you can see, the picot edge and the shale-like pattern somehow mysteriously appeared. The good news is that the emergency size 5 dpns made sock 1 fly off the needles–it took maybe three or four hours (the picot was tricky–never done that before). Sock 2, as of my lunch today, is a few rows past the gusset decreases and I only cast it on during Wednesday’s lunch. Why is it important to hurry these puppies up? Is it the nighttime temps in the low 40s? The satisfaction of finishing yet another object? Nope! Sunday starts Socktoberfest (see the button on the sidebar? 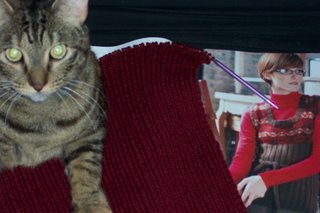 The smaller one being eaten by the Rhinebeck Bingo and Twisted Knitter’s buttons? Jess made it!) 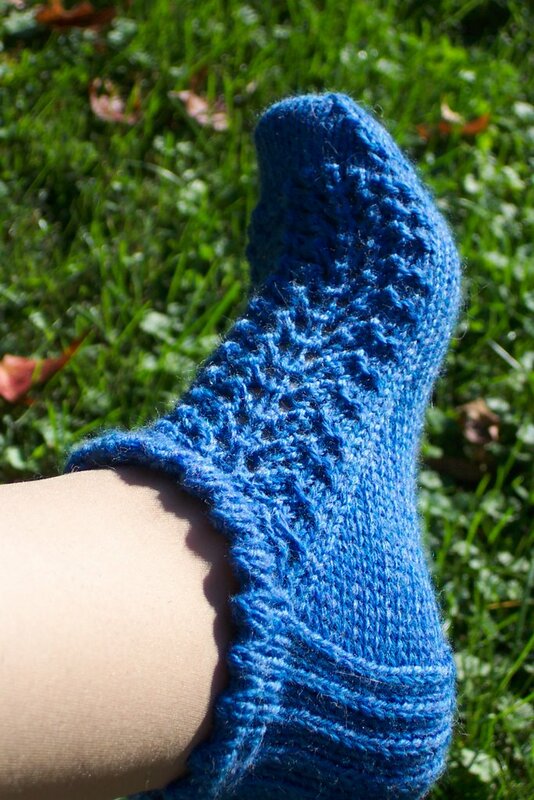 and I have a whole slew of socks I’m planning to knit. These blue anklets better be done by bedtime Saturday. I’ve got a lot to do. Finally, my Blogger template is giving me nightmares. Seriously. If anyone can offer advice on where to get a good lightly colored one (lavender? periwinkle?) or how to customize my header (even though I have no graphics program to make one) I will love you forever. I might even send yarn. But! I will be back to regular posting soon, this week’s copious wine drinking aside. I’ve been reading blogs, and even commenting on them, but it seems that each post I’ve tried to write recently comes out sort of half-formed, like too-clever D&D character that needs to be killed off quick. Tommorow, real post with real progress. Spinning! Socks! Jewish Holy Days! I have to go write a paper now, one that’s kinda due tonight. It seems my topic of The Social Consequnces of the Early Printing Press meets the paramaters of next week’s paper. Not today’s. Eeek. Or at least understand what the bugger they’re talking about. 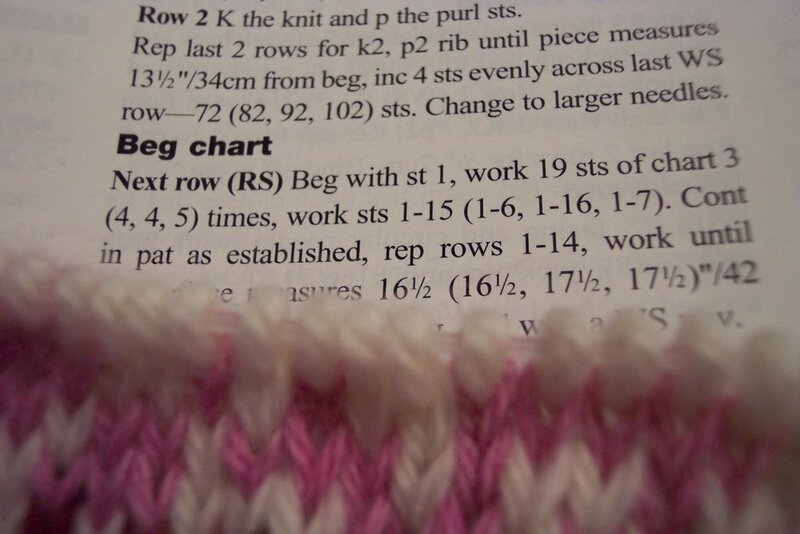 Beg chart: After reading this pattern, I realized that the best code breakers in the world make some pretty neat knitted items; that is if they know math. 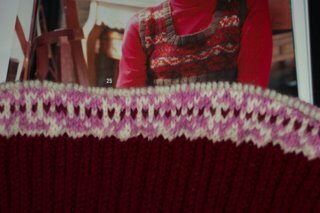 What I like about knitting, specifically fair isle, is the challenge of detail that becomes a pattern. Knitting with one color…zzzzz…boring. Give me two or three colors and the fun begins. Give me 5 (yes 5) and I’ll be ecstatic. For those of you who normally read this, you’ll notice something is off in the writing. You would be correct. Tonight’s guest author is (drum roll please) Mr. CygKnit. Why? Because tonight we are going to talk about knitting math, which is really nothing more than pattern recognition. Please note that I was NOT an English major and have a horrible time writing narrative papers on which I know nothing about. (That would be most of the papers I have ever written). Shall we start then? My wife started a fair isle sweater not too long ago. The first 13.5 inches went just fine, because it was one color. When it came time to start the extra colors, she started just fine. She asked me if it mattered how she read the chart, and I being the all naive ex-math teacher, looked at the chart and said “No, because the chart is symmetrical, it won’t matter” (Notice I did not read the directions, but hey, I’m a man!) She became a little lost repeating the pattern within the pattern so often, but we circumvented that with some stitch markers (mark each time you finish the pattern, then check it, then move on to the repeat). Simple enough, she did just fine. 9 rows later at what was to be the completion of this particular motif, she asked me to take a look, which I did. Hhhhmmmm…something is just not quite right, but what is it? She checked the more complicated rows with me and it was fine, so what happened? I’ll tell you what happened. You see, knitting patterns have the dubious honor of being read from left to right AND right to left, just as one knits. However, I have noticed, most pattern editors leave this seemingly small detail out. Ooops. You can see the chart above that we followed. Being a symmetrical chart, it is irrelevant which way it is read. 5 stitches in from the left or right is still the same color, which is just dandy (and simple). Let me show you the kicker and why directionality became an issue. Above are the directions we followed. I’ll type them out so you can follow along. Begin with stitch 1, work 19 stitches of chart (5) times. (We were working on the largest size, thus the “5”). Then work stitches 1-7. 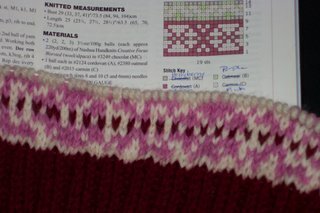 Continue in pattern as established, repeat rows 1-14…blah blah blah. We worked till row 9, which completed this particular colored pattern, which is when we noted the mistake. As I said above after the picture of the chart, it does not matter how you read the chart, whether from left to right, or right to left, because it is symmetrical. Fold it in half and it is completely identical. BUT, where the editor (or uneducated knitter, whoever you choose to blame) screwed up is where it says “Then work stitches 1-7”. What we have really is the chart repeated 5 times, and then a portion of the chart. 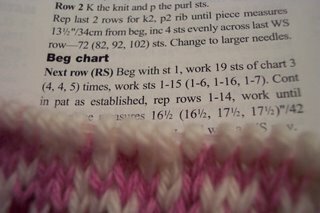 What this means is, depending on which way the first row is knit, the “portion of the chart” must ALWAYS be on one particular side. In our case, our first row of the chart was knitted left to right, so the “portion” must always be on the right. The best illustration I can think of would be brick laying. Imagine each row of the chart is a brick. The directions tell us to repeat the chart 5 times, or in this case lay 5 bricks. Then, knit 1-7, or lay a half brick. In order for the chart to line up completely, when laying the next row, the half brick must be laid on the half brick below, otherwise we get a traditional looking brick wall (meaning, the pattern within each row is askew to the row above and below). Good for brick walls, bad for knitting. The remedy? Easier directions. From left to right, chart 5 times, then stitches 1-7. From right to left, stitches 7-1, then chart 5 times. Suddenly, it all makes sense. Notice I reversed the stitches in the “portion” too? Looking at the first row of this pattern, we can see that stitch number 7 will be the last stitch in the row. 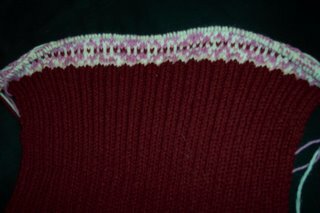 Much as the portion must line up with the portion in the next row, the stitches within in the portion must also line up. In other words, stitch number 7 will end the left to right rows, and start the right to left rows. Ta-da! We’ll show you this when we’re less frustrated and have completed the ripping and restitching of this pattern. Where I distract you with pretty pictures. 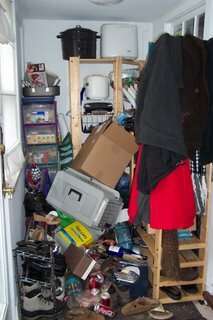 So, I was fixing the webrings on the side over there —> and kept seeing that awful picture of my mudroom. A new post was definitly in order, but what to post about? The bunny habitat is progressing nicely (read: 90% of crap is gone) and I did some fair isle over the weekend (read: FUBAR). 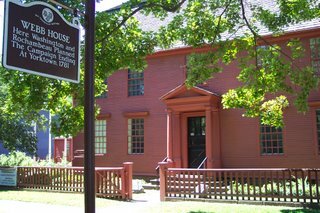 It is actually part of a larger historic area, which includes the Silas Deane House, the Issac Steves House, and more historic homes than you can imagine (trust me, I got lost there). We waited for the tour, which is the only way to see these three, and our rather congested guide fed me all the fascinating facts I could take (which I apparently have forgotten, or you’d have them here). 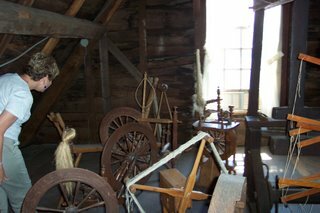 While I have a deep and abiding love for all things historical, I kept my eyes out for ONE thing as we toured each of the three houses: Spinning wheels. Finally, in the last room of the last house, I saw them. Notice the black chain in the foreground. Not only were they roped off, but I wasn’t allowed to take pictures. My sniffly guide did not care ONE bit about blogging, no sir he didn’t . My resentful little heart reluctantly climbed back down the stairs, and headed to the giftshop. I had decided not to buy any trinkets, as this was the week I had bought the wheel (read: blew all my cash until payday). As I wandered about, I saw…a docent knitting. 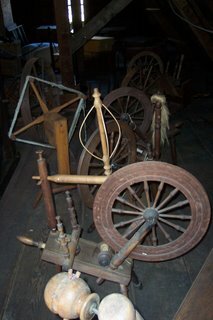 Of course, I had to ask, which led to me mentionioning spinning wheels, and how sad I was that I couldn’t take pictures. Know what she did? Took me and my camera upstairs! Then, she took me behind the rope. I heart knitters. 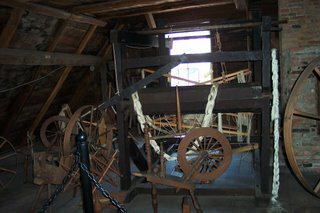 Because my baby is a castle wheel, and I never seem to see them wandering about, I was *thrilled* to see it. She even let me touch it. 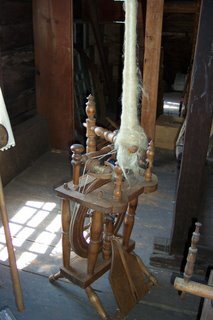 This one, set up for flax, is very different than mine, though (aside from not having its treadles set up). 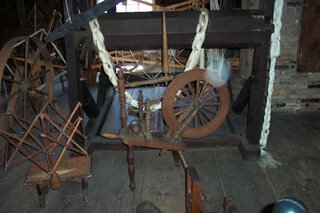 For those of you not thrilled with spinning, come back tomorrow. Mr. Cygknit has agreed to guest blog My Fair Isle Disaster, with charts and graphs to show you just how bad I am at following directions. Do stay tuned. 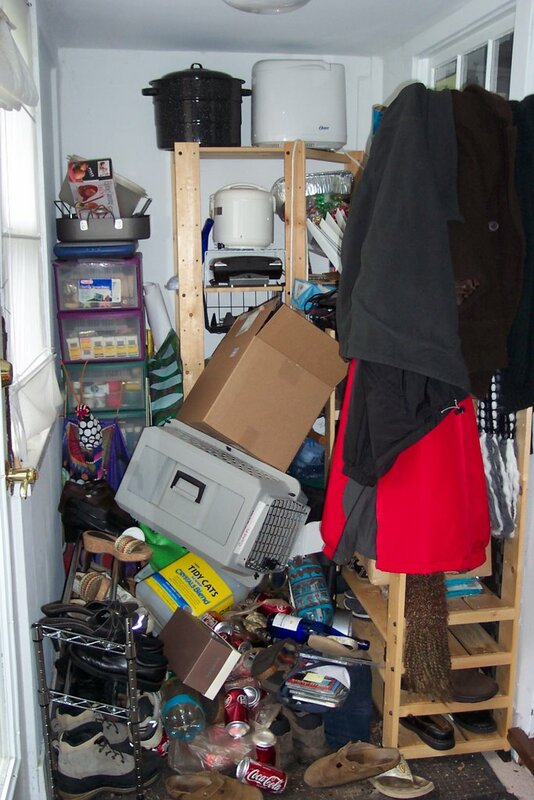 Then, once we’re thoroughly exhausted ourselves getting rid of useless junk, it’s off to Macy’s for their Shop For A Cause drive, where local charities benefit from folks buying stuff. Mr. Cygknit has been manning a table all this week to raise money for Western Connecticut Agency on Aging, the group that funds his job this past summer, protecting seniors from unfair consumer practices. He’s a good egg, that Mr. Cygknit. He’s started cleaning–I’d better go. It’s for the bunny, you know. Something about a work in progress?? As I got to the 13 1/2″ mark, and ready to switch from ten freakin’ miles of ribbing to fair isle, it occured to me…maybe I should blog this? I am so excited to be doing the fair isle, I could wet myself. Seriously. I have tried to revise that statment so I don’t sound so much like a sad little geek, but I can’t. Forget homework this weekend, I’m gonna be hanging out on Fair Isle. Well, yesterday’s super-fast dash-off of a post taught me a few things. First, I don’t make a whole lot of sense when I’m in a hurry. (I wonder, now, what that homework I was doing looks like. *shudder*). Second, innocent play with Blogger templates is a Bad Idea. Losing the html for my rings is a bit of a pain, as it will take away from some knitting schoolwork time to dig them all up again. Worse, it makes me all kinds of frustrated with my computer illiterate self for not performing basic data saving techniques. What’s even worse is that all this template playing has made me Dangerous. You know, in that just-enough-information-to-be-a-danger-to-yourself kind of way. I’ve been looking at all kinds of tutorials for creating your own templates, exploring different hosts (Typepad? Moveable Type? Other places that makes no sense to me, yet?) and generally slacking off at the high-stress zones of work and school. Told ya it was Danger, with a capital D.
So it is Wednesday and I *still* haven’t said much about my weekend ‘cept that I got a bunny (isn’t he cute? I can’t stop pulling that picture up. What’s wrong with me?). We left late Friday, after 9 pm, and drove to the ancient (seriously) Snow Lake Lodge at Mt. Snow. I wasn’t sure why we would do such a thing (this is a Mr. Cygknit plan in action), until Saturday morning when I figured out: Vermont is a very looooooong state. But not all of it is for me! The bag(s!) of roving in the back are for Mr. Cygknit. No, really! He has been playing with wool, in all kinds of special ways that deserve their very own post. The smaller bag with lots of colors is for needle felting, because “knitting and then felting is just too slow.” The bag of roving (I forgot what it is, do you remember Jess?) 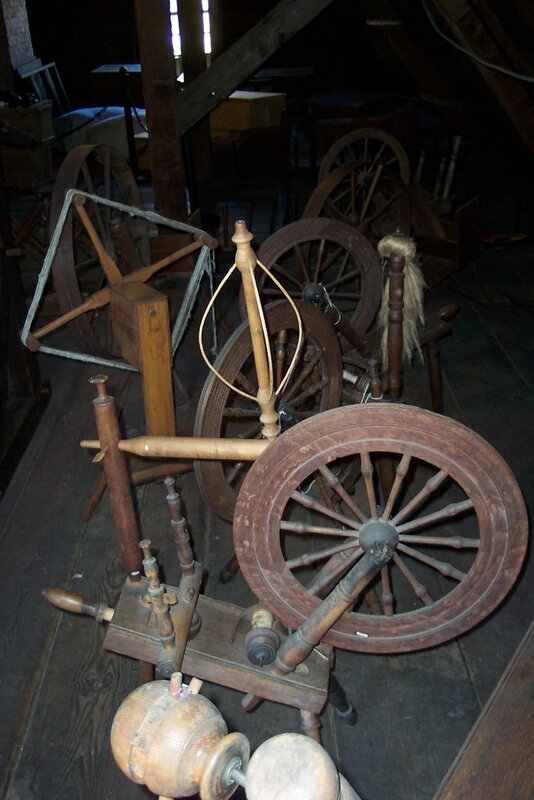 was something he fell in love with, and I’m considering having *him* learn how to spin it up. The two mushroom shaped blobs of color are silk caps, which I have NO IDEA how to spin (yet). But that’s beside the point. It’s soft! And silky! 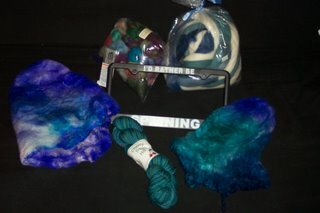 Finally, the yarn in the center bottom came from Kaleidoscope Yarns, and is for my mom’s shawl. Which I forgot to blog about. Here! Have a picture! What did I pick? Sivia Harding’s Diamond Fantasy Shawl. [Edited to add: This picture is from her site. I should have mentioned that.] I DID get a comment today about another shawl, Kiri. What is so tempting about it? 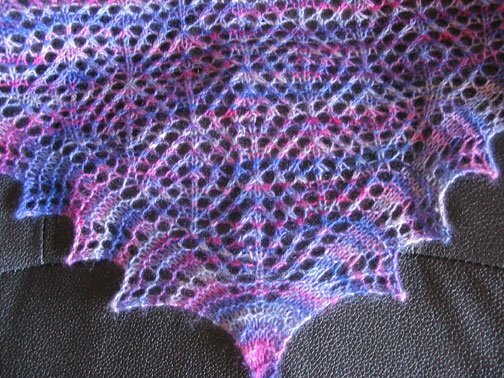 It is knit with oh-so-luscious Kidsilk Haze. Which I have been needing an excuse to buy. So, I’m not sure if I should thank you Spinning Fishwife, for providing me such a tempting choice or cry that I have to choose all over again! Tangent over. So that yarn shown above is Cherry Tree Hill um, something or other. (This is what happens when you dash out the door in the morning after uploading a pic you want to blog about. No forethought here.) Finally, the rectangular thing in the middle of the crappy picture? A license plate holder that says “I’d rather be spinning.” I am Such. A. Dork. The rest of the weekend wasn’t nearly so fiber-related, except…I drove through Rhinebeck. I drove through Rhinebeck, I saw the fairgrounds, and I would have looked for our hotel if I had even the smallest clue where I made the reservation. It occured to Mr. Cyknit on our drive home that my legedary ability to get myself totally and completely lost (and Dragon, in this case) might be helped with a little trip by next month’s (!!!) destination. I should probably stop buying fiber until then, huh?